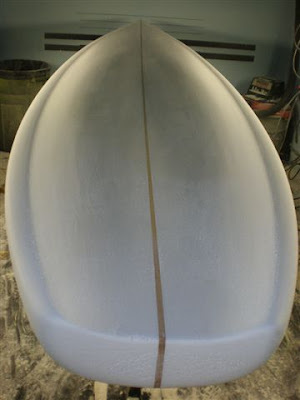 Tim Stamps just sent me these photos of yet another board he's been commissioned to build for the Stock SUP Class (12'6" and under, no rudder). I don't know what fast is (I'm one of the slowest guys out there) but I know Tim's got some ideas and they seem to equate to clean and quick. Evidently somebody out there agrees. Check out the latest creation to come out of the Stamps Board Works. There's a pretty obvious design difference between the Californian and Hawaiian race boards. If you check out the shapes of boards like the C4 Vortice, the SIC F-16 and others you'll see how much more rocker they've incorporated into the front sections of their boards. I'm sure it has to do with the type of water the Hawaiians are paddling in- their downwinders include pretty steep chop and open ocean swells. I don't think we're encountering the same conditions here in California. The boards I've seen (Eaton, Richmond, Bark, Mueller, Stamps) have all had really low rocker, low rocker is faster but only if there's limited chop and swell- I think. Anybody care to chime in regarding design differences? I'm not a shaper but what you're saying sounds reasonable. One thing for sure, Tim is one creative guy! I love his shapes, they just look clean and beautiful...like they would really work well! Summer's coming- I thought awhile back you were looking for a new board? I rode a local shaper's (Brett Bender - Natural Selections) 10'1 by 29.5 by 4 1/8" with pinny roundtail and pretty pulled nose. It was pretty thin (4 1/8") so it was a little awash- but not too bad. The board surfed really well- I think we can come down in volume any other dimensions... interesting to work down to the shape that does what you need it to. Can you tell I'm itching to try some new boards? Like any good surf(SUP)board addict I'm always looking for the next board! 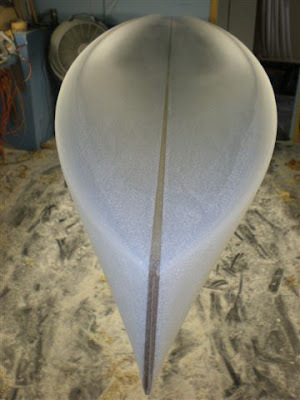 And like you, looking for that perfect blend/balance between paddling and performance. It was a perspective expanding experience riding the 10'3" X 27 X 4.25 Surftech Takayama the other day. It rode like a performance longboard. With greatly reduced volume overall (compared to my 10'4" Angulo Olohe) it took more energy just to paddle and balance on the Tak. (And I'm a little guy...150 lbs.) The board really was only good for surfing. I wouldn't want to just paddle it. Is that what I want? A SUP for surfing only? Moving in that direction is definitely moving in the direction of a quiver. $$$. That's a great point you bring up! And, we are moving towards a quiver of SUBs- at least I know I would be. I'm looking for that smaller, lighter (no gloss coat on this next one) tight turning board that I can use here on the beach breaks. The 10' works well but I really dug that 8'0 and the way it'd go to the lip at will. It'd be a board that I'd travel with too- a "one spot +" board that'd be good for paddling out to a peak and hitting spots within a mile of it. I would have to keep the 10' though- it'd be the board I chose to paddle the six mile round trip out to the Point and the board- I'd cruise the Cliffs with. I just wonder though- if Stamps made the board to my specs, how much paddleability would I really lose? The Takayama, if custom made, could be altered to fit your needs and as you know, small changes make big differences. We'll never really know until you win the Lottery and order one up from the man himself. "If we go down to smaller boards, where are we going with stand up? It begs the question: What's the point? Why not just prone surf then?" Exactly! And that is the same question I asked myself after riding the light and maneuverable Takayama. Because what I lost with all that surfboard performance, was the ability to roam from place to place with relative ease. And the board didn't surf like a "SUB," i.e. there was a qualitative difference that was no longer present because SUP surfing is different and I like the difference. The difference is the added dimensions that a SUP provides. With a SUP I can paddle from surf spot to surf spot at will. I can stop surfing and tour the kelp beds, follow a pod of sea otters, do a down winder or go on a two-mile adventure tour just for grins. You lose that freedom when you gain the one dimensionality of the SUP surfing like a surfboard. 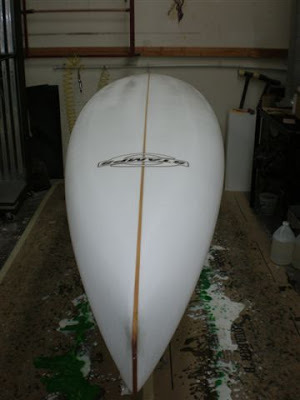 Now the question is, is it possible to design and build a SUP that "does it all?" A true "all rounder." 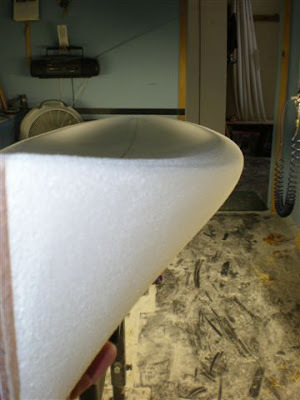 I'm not so sure it is any more possible to do that, than to build a "one size fits all" surfboard. A surfboard that paddles like a longboard and surfs like a thruster, or a fish or a gun (or all three). But if there is one of these around somewhere, in someone's inventory or their mind...I'd love to ride it!